This little two-tone baby cardigan is a simple and elegant layering piece for when the weather is still cold and a little extra warmth is much appreciated. With its eye-catching dot yoke and soft A-line shape, it is bound to become a timeless favorite. This cardigan is worked back and forth from the top down in one piece, with a reverse single crochet neck and hem finishing in a contrasting color. 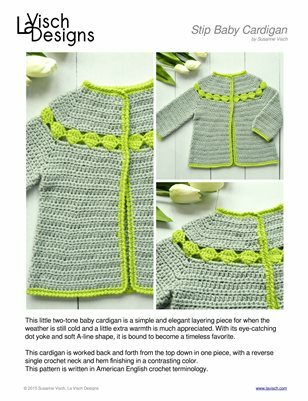 This pattern is written in American English crochet terminology.